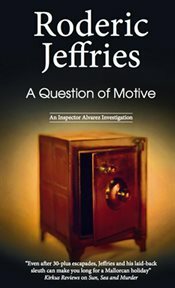 The item A question of motive, Roderic Jeffries, (ebook) represents a specific, individual, material embodiment of a distinct intellectual or artistic creation found in Charlotte Mecklenburg Library. When there is nothing to choose between accident, suicide, or murder, motive is the only clue...A rich Englishman is found dead at the foot of a steep wall of rock in Mallorca. Was it an accident, suicide or murder? Inspector Alvarez thinks only motive will provide the answer. But he quickly discovers the dead man can be linked to just about every other English person on the island - including Mary, the dead man's niece and heir to his fortune, to whom Alvarez is becoming uncomfortably close . .